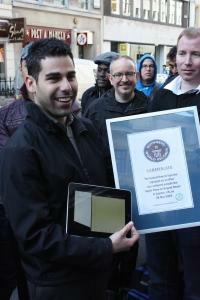 A Maltese national has ended up in the Guinness World Records for the fastest time to type the alphabet on an iPad. Joseph Grech, 28, who lives in London, queued from 3 a.m. outside the Apple Store before making his record attempt and setting a new global standard of 6.61 seconds for his fingers to go from A to Z. “I was really looking forward to being one of the first to get my hands on an iPad, so to also end up getting a Guinness World Record is incredible. “I’m really happy and can’t wait to brag to my friends about it." Mr Grech was up against over 30 others.